A Severn mother gets the favor of the jury in a bed bug case against a furniture store and gets $225,000 for the damages. On the other hand, BedBugControl911.com suggested the use of a safe bed bug spray to other bed bug victims for an effective yet inexpensive treatment. Wherever bed bugs are, one thing holds true – they cause a lot of troubles. Last December 2010, Adarien Jackson of Severn, Maryland filed a bed bug suit against a furniture store where she brought her sons' bunks. A little more than a year later, the mother-of-two was favored by the jury granting her $225,000 for the damages. Based on the report by the BaltimoreSun.com, Calidad Furniture & Linen Inc was named the defendant in the suit. Jackson filed the lawsuit last December 01, 2010 with the case number 02C10157321 at the Circuit Court for Anne Arundel County – Civil System. It said that her problem with bed bugs started in July 2010. It was when her six-year old son Kaden and his twin brother Kyler complained of being bitten and crawled-in by bugs just weeks after the beds were delivered that she knew about the infestation. When Jackson complained to the company about her bed bug encounter in her sons' bunks, it is said that she was denied a refund. Hence she filed a suit against the company. Originally seeking just $150,000 for damages, her recently concluded case is now one of the largest bed bug liability judgments with her receiving $75,000 more than what she sought. A mother in Severn, Maryland recently won her court battle against a furniture store that sold her two bed bug infested bed bunks. According to the report, she and her sons received $225,000 for the ordeal they had to go through due to the bed bug infestation. Adarien Jackson first encountered bed bugs back in July 2010 when her son Kaden complained of itchy bumps on his ankle. First thought of as allergies, her son was given allergy drugs by a dermatologist. They also tried diet changes and oatmeal baths. However, it was when his other son, Kyler, began complaining of being crawled over by bugs in the middle of the night that she found out that bed bugs were the ones causing the problem. First denied a refund, Jackson filed a suit in December 2010 against Calidad Furniture & Linen Inc seeking only $150 000 in damages. After a year, the jury of ruled out in her favor awarding her more than what she sought. Her case was deemed one of the largest bed bug liability judgments in the country today. In July 2010, Adarien Jackson's 6-year-old son, Kaden, began complaining of itchy bumps on his ankles. They soon turned into a rash and spread to his back, behind his ear and on his eyelid. The child's pediatrician and dermatologists tried allergy drugs, diet changes, oils and oatmeal baths. But it wasn't until months later that Jackson discovered the cause of the problem. Kaden's twin brother, Kyler, began waking in the middle of the night, crying out, "Bugs are crawling on me!" Jackson realized her sons' beds — which she had recently purchased from a furniture store in Elkridge — were teeming with bedbugs, according to a lawsuit she filed in Anne Arundel County in December 2010. On Thursday, a jury ordered Calidad Furniture & Linen Inc., the store that sold Jackson a pair of wood-frame beds, to pay Jackson and her sons $225,000 for the ordeal. 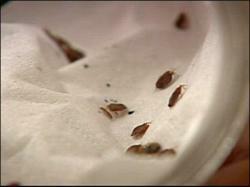 It is one of the largest bedbug liability judgments in the country. Wherever bed bugs are, one thing holds true – they cause a lot of troubles. Hence, whether you have to deal with bed bugs in Florida or any other place, an effective treatment must be implemented. And though hiring an expert is the easiest and most convenient option to take to kill the pests it is also the most expensive. So for those in a tight budget, BedBugControl911.com suggests the use of a bed bug spray instead. With the solution, you can get rid of bed yourself fast and easy without spending big. Nonetheless, of all the bed bug sprays available today, the site only suggests the use of a pesticide-exempt solution for a safe treatment. To find that safe bed bug spray and get a sample of it, visit http://www.bedbugcontrol911.com today.